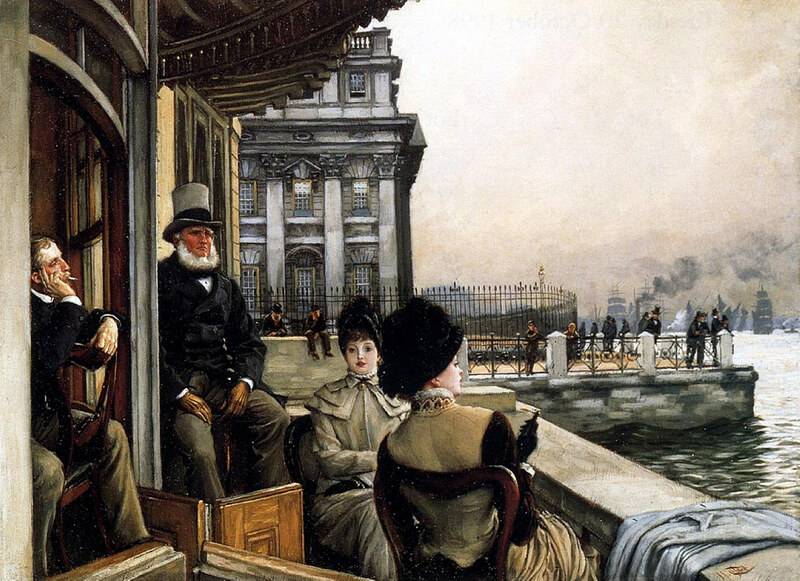 Many of James Tissot’s most memorable oil paintings feature images of women waiting. Sometimes they are with men, but the focal point is the woman’s impassive face and languorous mien. They are not waiting for anything, particularly. Yet rather than being pleasant and relaxing, these scenes are oppressively still and sometimes claustrophobic. 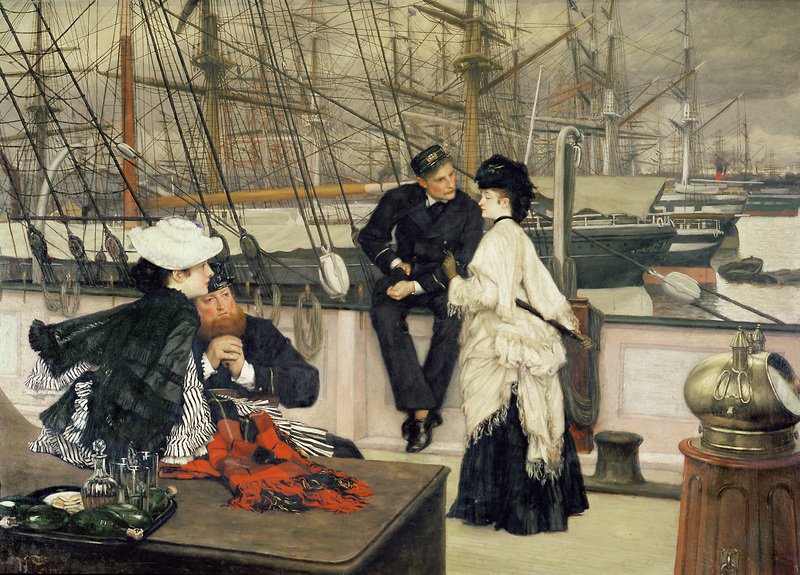 A Visit to the Yacht (1873), by James Tissot. Oil on canvas, 34 by 21 in./87.6 by 56 cm. Private Collection. (Photo: Wikimedia.org). In A Visit to the Yacht (1873), the two couples and the girl do not interact. They are bored and tense, just waiting in the same small space. 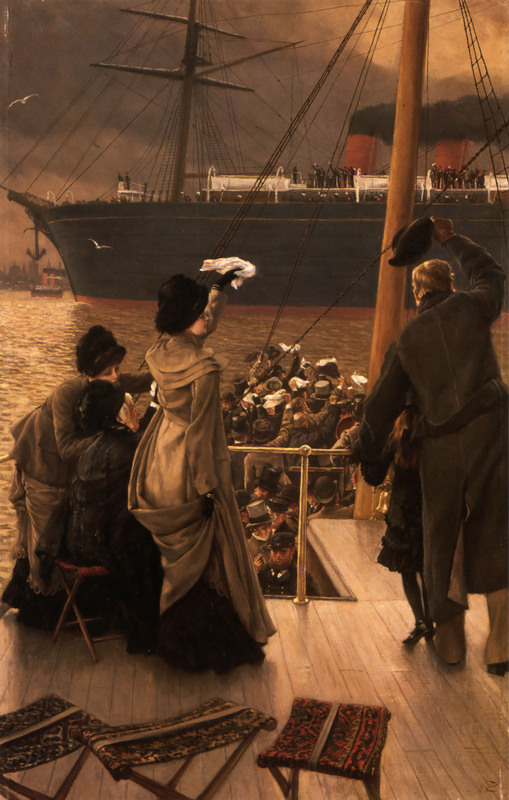 Tissot sold this picture directly to Agnew’s, London for £650, as La Visite au Navire. Shortly after, Agnew’s, Liverpool sold the picture to David Jardine (1827-1911), a Liverpool timber broker, ship owner and art collector. Jardine was born in New Brunswick, to a family that had grown wealthy from the Canadian timber industry. 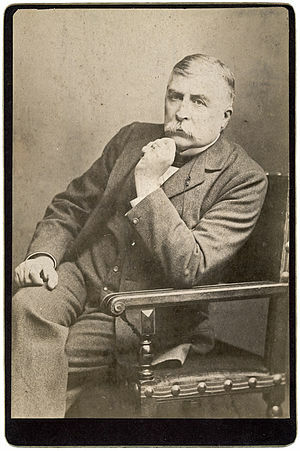 After moving to Liverpool, Jardine eventually became Chairman of the Cunard Steamship Company. In 1922, the painting was purchased at Christie’s, London by Vicars Brothers, art dealers in London. William Hulme Lever, 2nd Viscount Leverhulme (1888 – 1949), who co-founded Unilever in 1930, purchased Tissot’s A Visit to the Yacht from the Leicester Galleries in 1933. Upon his death, Philip William Bryce Lever, 3rd Viscount Leverhulme (1915 – 2000), succeeded to the title; he became Lord Lieutenant of Cheshire a few months later and was appointed a Knight of the Garter in 1988. Prior to his death in 2000, he lived and entertained at Thornton Manor in Cheshire, where his guests included Her Majesty the Queen Mother, Prince Philip, Princess Margaret, and Lord Snowdon, as well as members of other royal families, heads of state, and notable people from the worlds of industry, academia and the arts. The last male descendant of the 1st Viscount Leverhulme, his titles became extinct. Tissot’s A Visit to the Yacht was owned by the Estate of the 3rd Viscount Leverhulme, which sold The Leverhulme Collection from Thornton Manor at Sotheby’s in June, 2001. However, several paintings including A Visit to the Yacht were exhibited at the Lady Lever Art Gallery by the 3rd Viscount’s Executors. The Trustees of the 3rd Viscount Leverhulme Will Trust offered Tissot’s A Visit to the Yacht for sale at Sotheby’s, London on December 4, 2013, but it did not find a buyer. However, it was announced later that the painting was sold privately to a buyer in the United States for a price within the estimated £2 to 3 million GBP it was expected to bring at the auction. 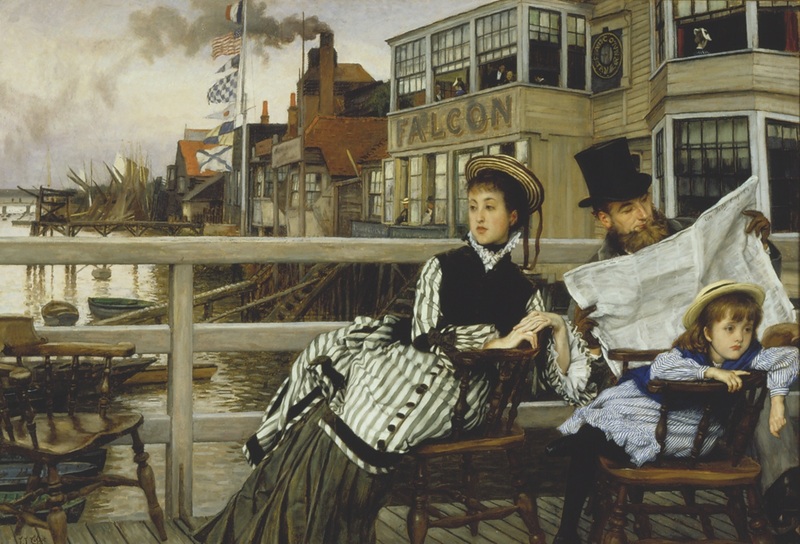 Tissot painted three versions of Waiting for the Ferry, one in 1874 and two around 1878, at the dock beside the Falcon Tavern, Gravesend. The women in these pictures don’t look preoccupied with their thoughts, or bored, as if they had something better to do: they’re simply waiting. In Tissot’s Waiting for the Ferry at the Falcon Tavern (1874), man is busy reading, the little girl is obviously bored, but the woman is calmly waiting. This picture was exhibited at Nottingham Castle, and at Newcastle-on-Tyne in 1887. It then was in the collection of James Hall, Esq., a prominent collector of Pre-Raphaelite art and the grandfather of Mrs. Edward Reeves, who sold the painting at Christie’s, London in 1954 to the John Nicholson Gallery, New York for $ 4,339 (£ 1550). In 1963, prominent collector Mrs. Blakemore Wheeler, who had owned the painting by 1957, gifted it to the Speed Museum in Louisville, Kentucky. In about 1876, Tissot’s young mistress and muse, Kathleen Irene Ashburnham Kelly Newton (1854 – 1882), moved into his home at 17 (now 44), Grove End Road, St. John’s Wood, London. Tissot often painted her in his house or garden. Since they did not marry, they could not socialize in Victorian Society, but they made excursions outside London to places including Greenwich. 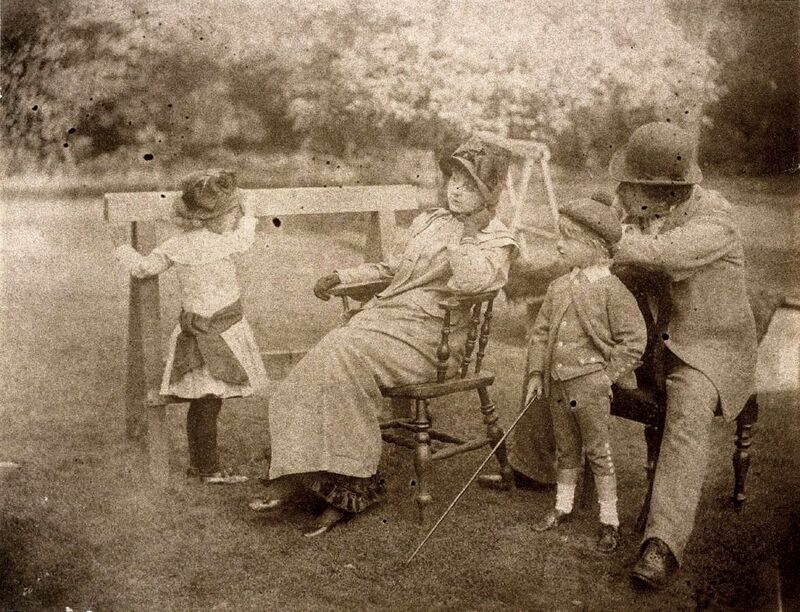 The man in this picture, who may have been modeled by Kathleen’s brother, Frederick Kelly, is obviously bored, but the woman just waits. This version of Waiting for the Ferry was with Leicester Galleries, London, by 1936, and again until about 1953. It was purchased by by English actor Alec Guinness (1914 – 2000) around 1955, before he was knighted, and it was sold at Christie’s in 1977 as Waiting for the Boat at Greenwich. It was purchased by the Owen Edgar Gallery, then by Roy Miles Fine Paintings and by 1984-85 belonged to Samuel A. McLean. 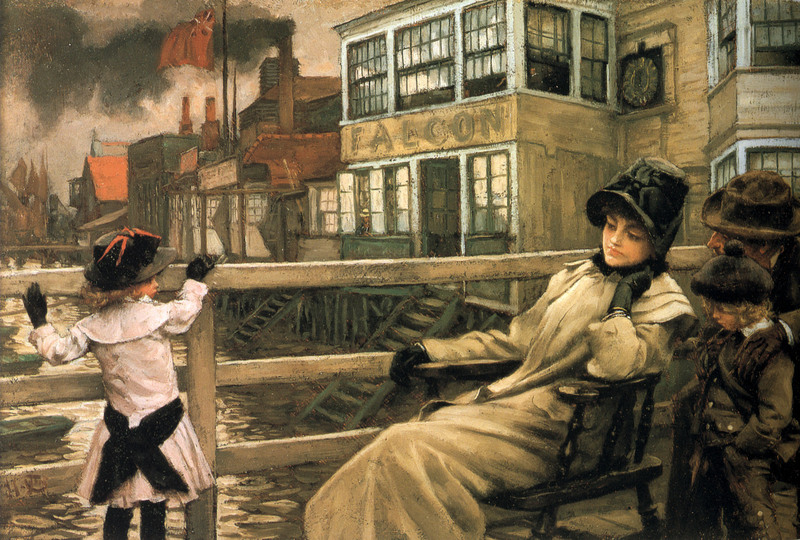 This version of Waiting for the Ferry does show the woman, modeled by Kathleen Newton, looking as bored as the two children, while the man, who was modeled by the artist himself, appears to be talking or whispering to her. This picture was owned by Mrs. Viva King by 1968. In 1920s London, Viva King was a beautiful and vivacious free spirit called the “Queen of Bohemia” by English writer Osbert Sitwell. Her husband, Willie King, was a curator at the British Museum, and in the 1940s, Viva was the hostess of a successful salon at Thurloe Square. Her Waiting for the Ferry later belonged to Charles de Pauw. It was sold at Christie’s, London in 1978 for $ 39,754/£ 22,000; Sotheby’s, London in 1986 for $ 73,568/£ 49,000; and Christie’s, London in 1993 for $ 148,650/£ 100,000. Incidentally, while this version of Waiting for the Ferry is supposed to have been painted around 1878, Kathleen Newton’s son, Cecil, was born in March, 1876, and he clearly is older than two or two and a half here. In fact, it must have been painted in 1882, when Tissot painted Cecil at about six in The Garden Bench, wearing the same knit cap and brown suit. That would make the young girl in this Waiting for the Ferry Lilian Hervey, Kathleen Newton’s niece, who was seven in 1882 [Kathleen’s daughter, Muriel Violet Newton, was born in December, 1871 and would have been about ten at this time, too old to be the girl shown in this version of Waiting for the Ferry]. 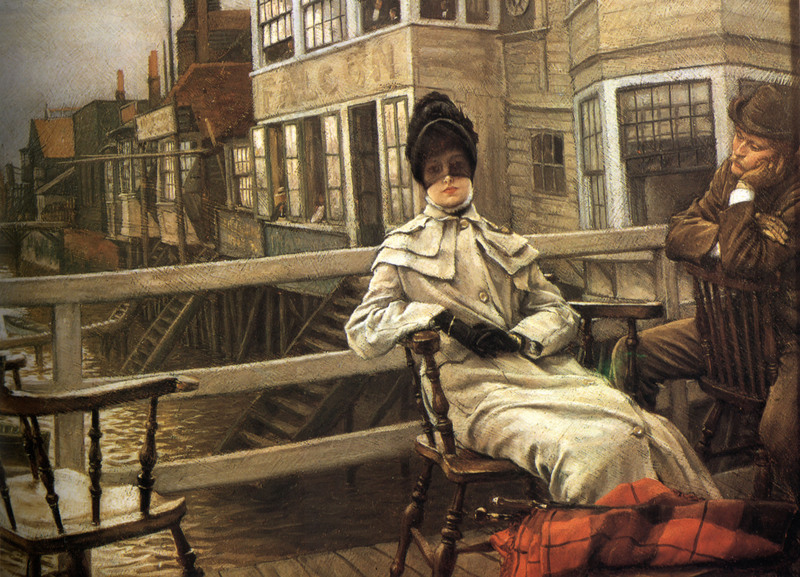 Tissot, Kathleen Newton, Cecil Newton, and Lilian Hervey posed for a photograph that gives some insight into how the artist composed this version of Waiting for the Ferry. On the Terrace of Trafalgar Tavern, Greenwich, London (c. 1878) depicts people in a situation that suggests social interaction, but they appear to merely wait for something, with only the smoker evincing boredom. This painting is inscribed “No. 1 Trafalgar Tavern/(Greenwich)/oil painting/James Tissot/17 Grove End Road/St John’s Wood/London/N.W.” on an old label on the reverse. It belonged to Sir Thomas Wilson, Bt., before it was sold at Sotheby’s, Belgravia in 1970 for $ 9,839/£ 4,100. As “The Property of a Lady of Title,” it was sold at Christie’s, London in 1993 for $ 193,245/£ 130,000. It is now in the collection of the New Orleans Museum of Art, Louisiana. No other painter painted the act of waiting like Tissot, or as often as Tissot did. 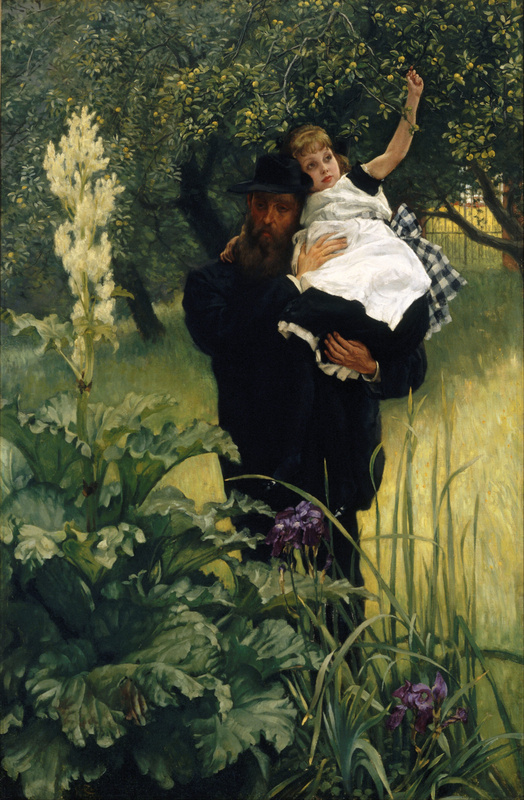 This entry was posted in Art blog, Art History, Impressionists and tagged Cecil Newton, James Tissot, Kathleen Newton, Lilian Hervey on June 16, 2015 by Lucy Paquette, author of The Hammock: A novel based on the true story of French painter James Tissot. 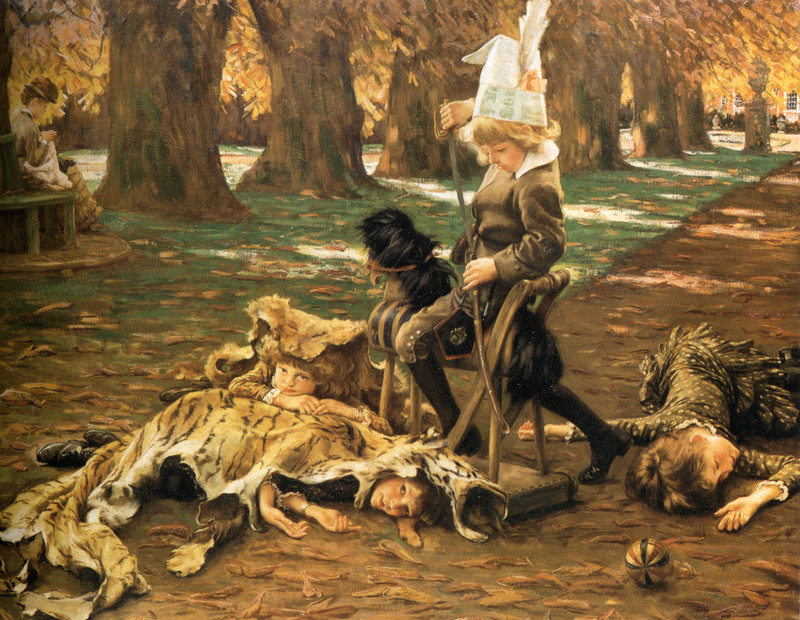 Was James Tissot the father of Kathleen Newton’s son, Cecil George Newton, born in 1876? It’s an interesting question, and to my knowledge, there is no documentation. It is widely speculated that Tissot was Cecil’s father. In the past four years that I’ve been researching Tissot, various online sources (art gallery biographies of Tissot, Wikipedia, art websites and blogs, etc.) once stated that Cecil “may have been” Tissot’s son, then that he “is believed” to be Tissot’s son or was “presumably his” – and increasingly, many now state that “it is generally accepted that Cecil is Tissot’s son” – but they cite no sources. To date, I have seen no evidence proving that this is a fact. My research into a range of scholarly sources, and the facts on inheritance law in France during Tissot’s lifetime, lead to me conclude that Tissot was not Cecil’s father. What is known is that Kathleen Irene Ashburnham Kelly married Dr. Isaac Newton on January 3, 1871, at age 17. Her daughter, Violet Newton*, was born on December 20, 1871, whether the daughter of her husband or the man – Captain Palliser – over whom her husband divorced her within days of their marriage (the decree nisi was issued on December 30, 1871). The focus of mystery is Kathleen’s second child, Cecil George Newton, born March 21, 1876; she registered his father as Dr. Isaac Newton. Tissot went to Venice on holiday in early October, 1875 with Édouard and Suzanne Manet for several weeks. If he had fathered Cecil, it would have been by the end of June, leaving Kathleen Newton for Venice in the second trimester of her pregnancy; he returned by mid-November. The date that they began living together, supposed to be around 1876, coincides with this pregnancy and Cecil’s birth, but that in and of itself is not proof that Cecil’s father was James Tissot. Willard Misfelt, in his 1971 doctoral dissertation on James Tissot, details the circumstances of Cecil Newton’s birth at 6 Hill Road, the home of Kathleen’s sister, Mrs. Mary Pauline Hervey (1851/52 – 1896). 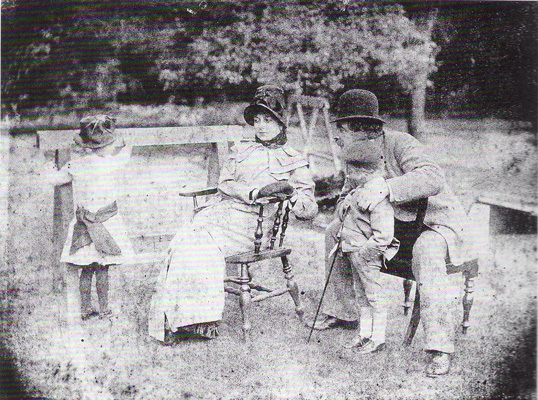 They lived just around the corner from Tissot’s large house at Grove End Road in St. John’s Wood, London. Mrs. Hervey (whose husband was said to be in the Indian army) had only lived at this address since “1876 or very late 1875,” according to Misfeldt: “If Tissot was the actual father of Mrs. Newton’s second child (she registered the father as the man who had divorced her five years earlier) the meeting would have taken place no later than June, 1875, and presumably earlier, at which time Mrs. Hervey and her entourage were nowhere near St. John’s Wood.” However, between the date of this dissertation and his 1985 review of Wentworth’s book on Tissot, Misfeldt learned of the “family oral tradition” that Cecil Newton was Kathleen’s son. 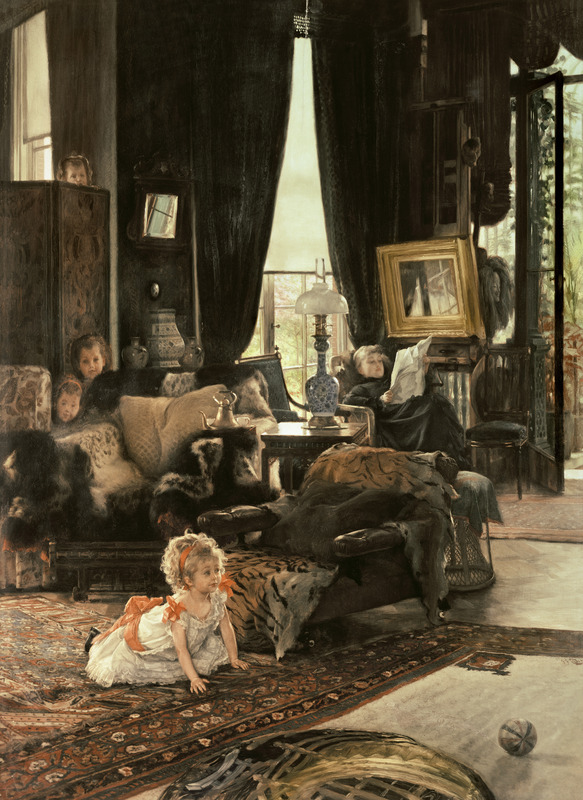 Hide and Seek (1877), by James Tissot. National Gallery of Art, Washington, D.C. Photo courtesy of The Bridgeman Art Library for use in “The Hammock: A novel based on the true story of French painter James Tissot,” by Lucy Paquette © 2012. In this work, Christopher Wood (1941 – 2009), director of Nineteenth Century Paintings at Christie’s, London from 1963 to 1976 and then an art dealer at the forefront of the revival in interest of Victorian art in the late 20th century with his gallery in Belgravia, stated that he did not believe Tissot was Cecil George Newton’s father. He pointed out that Tissot left his estate to his French niece, though under French law he could have adopted an illegitimate son and left him his property. 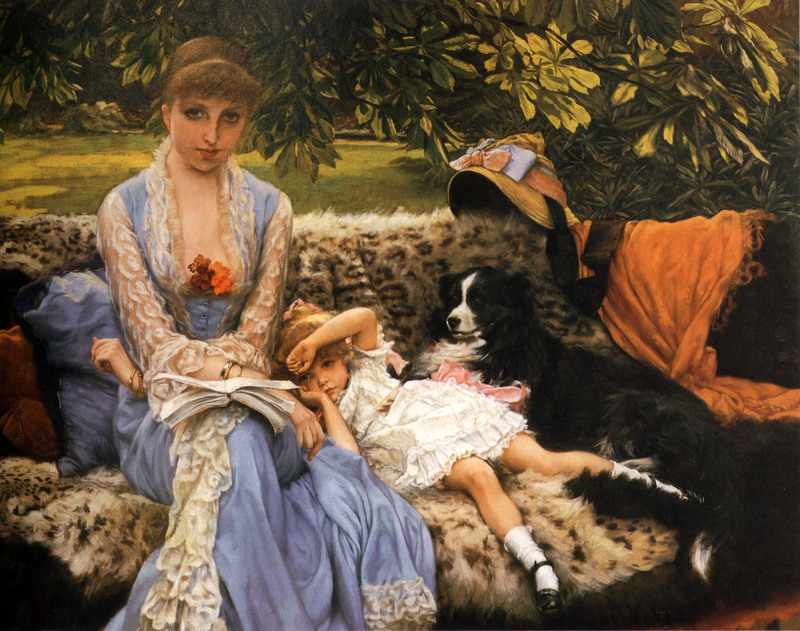 Wood also argued that, like British painter Frederick Sandys (1829 – 1904) – who married a working class girl – Tissot could have married Kathleen and legitimized Cecil – if Cecil were his son. But then, it is possible that Kathleen Newton, as a divorced Catholic in that era, may not have felt able to remarry. I find it hard to believe that Tissot, in moving back to Paris upon Kathleen Newton’s death, would have abandoned his own son – his only son as well as his only child, and the child of the love of his life. Cecil [if legitimized] stood to inherit the family name with a château in Besançon, France in the family for two generations as well as an elegant villa at 64, avenue du Bois du Boulogne [originally called the avenue de l’Impératrice, now avenue Foch], one of the most exclusive addresses in Paris. Based on my extensive research, James Tissot seems to have been a decent man who was kind to Kathleen’s daughter and son in the years the couple spent together. He painted Violet and Cecil as the adorable children they were – just as Millais, Renoir and other artists of the time painted numerous images of adorable children. 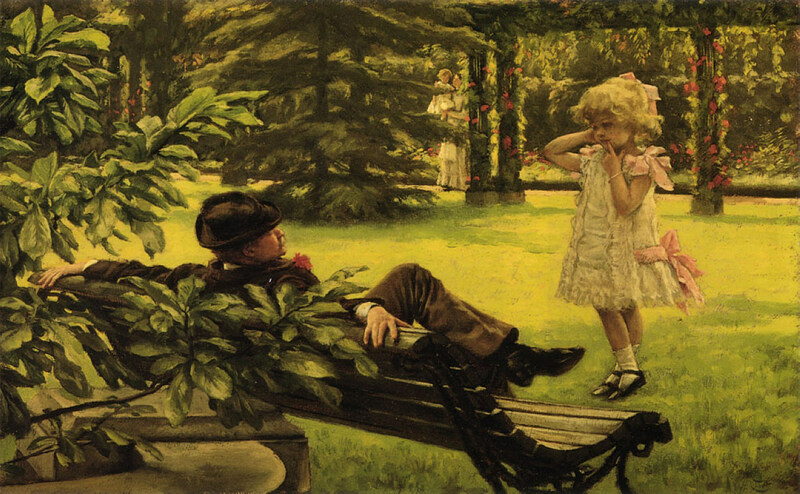 In The Garden Bench, the mischievous boy (with his bold, direct gaze at the viewer) is highlighted, the center of his proud and indulgent mother’s attention, while the affectionate girls are relegated to the background, portrayed as demure and passive – all in keeping with the era’s assigned gender roles. 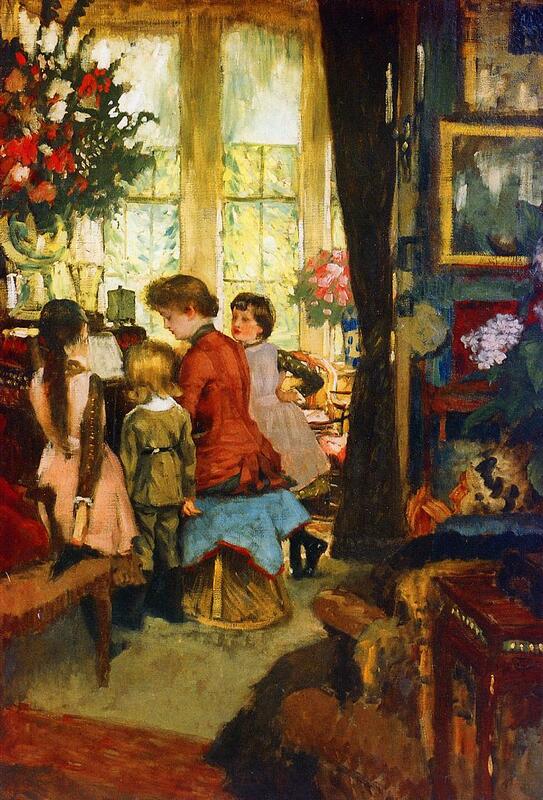 Tissot kept The Garden Bench, hung in the central stair hall of his château for the rest of his life, as a reminder of his happy days of family life in London. There is no record of whether, or how often, Tissot exerted himself to keep in contact with Cecil Newton – but we do know what his Will, drawn up in January, 1898, provided upon his death in 1902. 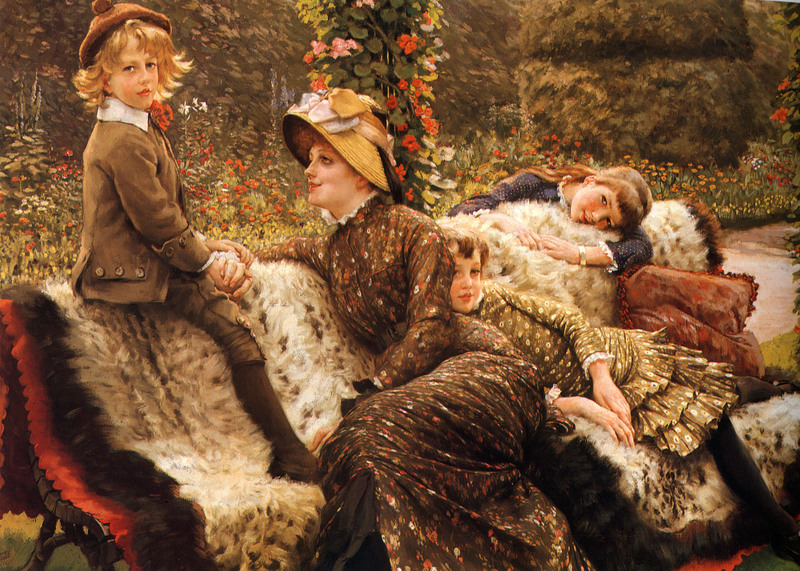 While dividing his assets between the three surviving adult children of his eldest brother, James Tissot’s Will stipulated that each of Kathleen Newton’s two children (whose addresses were located by a servant) would receive 1,000 francs. Tissot’s servants were provided for more generously: each received 200 francs per year in his service, employment with full wages for a period of one year after his death, plus 1,000 francs. Cecil married at 28, two years after Tissot died, and served in the Royal Artillery during World War I under the name Cecil Ashburnham. He was commissioned a second lieutenant in 1915 and was discharged as an invalided officer less than a year later. He was divorced at age 48, and died as Cecil Ashburnham on May 4, 1941, at 21, First Avenue, Lancing (a town on the English Channel, near Brighton). Cecil left no Will, but his estate, valued for probate at £108.12s.6d, was administered by George Ashburnham Newton, of Llandudno, a seaside town in Wales. 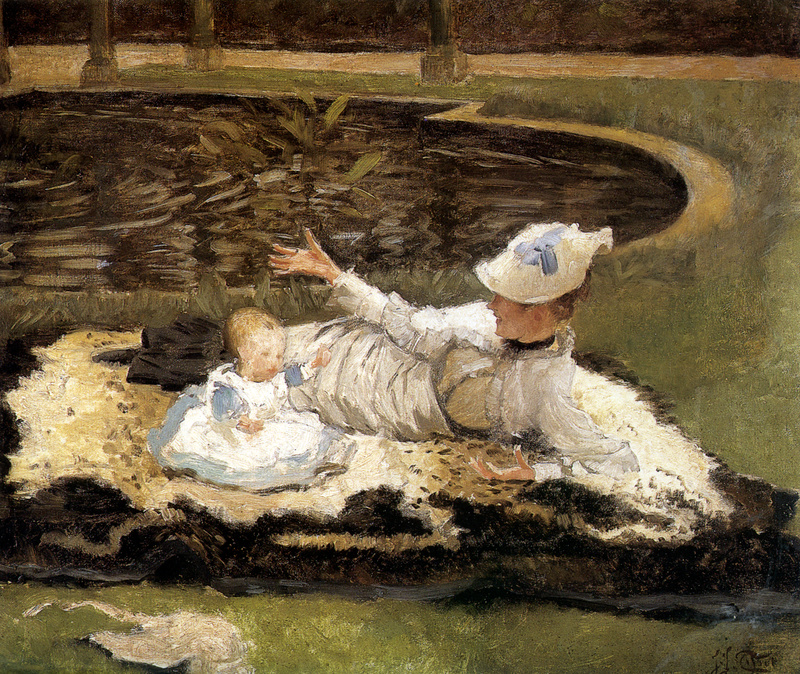 With no conclusive evidence, I decided that it was as plausible that Cecil was not Tissot’s son as that he was, and I developed the story line for The Hammock: A novel based on the true story of French painter James Tissot accordingly as I continued my research. As with any of the mysteries surrounding the fascinating life of James Tissot, I would be pleased to see facts emerge that prove one theory or another; I was trained as an art historian. As a novelist, I chose to portray the facts on this subject according to my best information at the time. 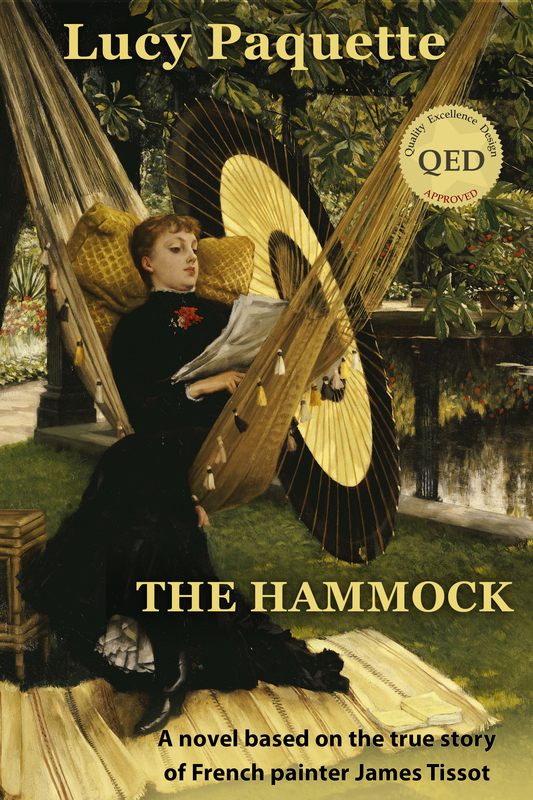 To see how I reconciled the question of Cecil’s paternity, read The Hammock. * Muriel Violet Mary Newton, born on December 20, 1871 in Conisbrough (a town in South Yorkshire where Kathleen Newton’s father had retired from the East India Company), attended Pensionnat de Soeurs de la Providence et de l’Immaculée Conception at Champion-lez-Namur, Belgium. She married William Henry Bishop on October 19, 1925 in London and died of a heart attack on December 28, 1933 at the Hotel Cristina in Alcegiras, Spain. She is buried in Spain. For biographical information on Kathleen, Isaac, Violet & Cecil Newton, see Willard E. Misfeldt’s J.J. Tissot: Prints from the Gotlieb Collection (Art Services International: Alexandria, Virginia, 1991). 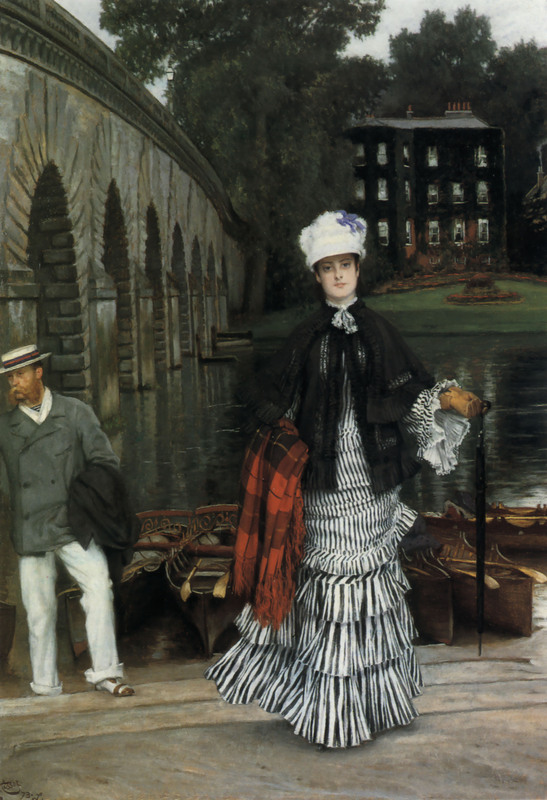 This entry was posted in Art blog, Art History, Impressionists and tagged Cecil Newton, James Tissot, Kathleen Newton, Violet Newton on October 20, 2013 by Lucy Paquette, author of The Hammock: A novel based on the true story of French painter James Tissot.